Why is Berlin perfect for travelling families? Berlin is flat and comes with broad sidewalks. It’s safe and you won’t find it hard to find your bearings. The public transport system is moderately clean, fast and efficient. There are lots of different attractions that are worthwhile exploring and that young and old alike will enjoy. It’s beautiful in summer and perfect in winter. 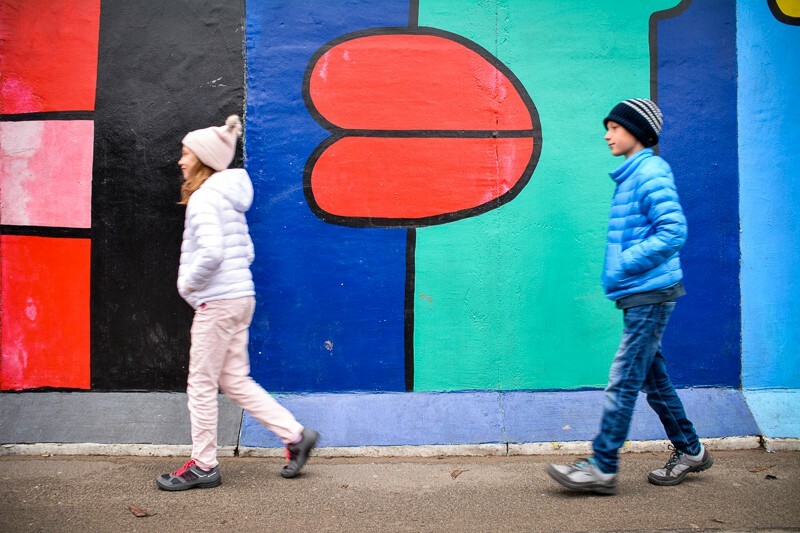 We spent the week between Christmas and New Year’s in Berlin with our two children, 8 and 10. In this time we explored a city that we used to call home for three wonderful years. We wanted to show the children what Berlin was all about. The history and the division, the subculture and the arts, the quirky and the beautiful. Of course, we had to throw in some things that the kids would adore more than us. However, everything else was perfectly fine for a family vacation. Take this tried and tested itinerary for 7 days in Berlin with kids as a guide from someone who is indeed German and used to live in Berlin herself. (Update: We just moved back to Berlin after living abroad for 14 years – this is how much I love this city!). We offer plenty of variety and also some suggestions of attractions we didn’t get to do this time around. We booked Downtown Apartments in Mitte and got really lucky with our choice. The apartments are brand-new and very, very comfortable. Our suite consisted of a small hallway, a bathroom, kitchen/living room where the children slept. With sliding doors with could close off a separate bedroom for ourselves. We had free wifi, two TVs with hundreds of programs, underfloor heating, dishwasher and a laptop-sized safe. Breakfast was not included but could be easily fixed at home thanks to the supermarkets and bakeries in the neighbourhood. There is also a café nearby. The next S-Bahn station was just across the street, Nordbahnhof, and two trams would stop just in front as well. Right next to the building there was a water playground. Not suitable for us in winter, but if you are visiting in summer, your kids will love it! Check out rates here, and if you consider booking through this link on Booking.com it will grant us a small commission (Affiliate Link). We arrived around mid-day at Schönefeld Airport and took the taxi to the apartment. There are also public transport options available to get you into the city. But when you travel in winter with children and luggage you may prefer arriving at your destination with more comfort. Of course, we were keen to get right into the midst of things, so we walked from the apartment all the way to one of the biggest stations in Berlin, Friedrichstrasse Station. Here we bought at the service centre the best ticket options available. It got us covered for unlimited travel around Berlin for the upcoming week. We also had our first Currywurst right at the station, complete with fries and mayonnaise, at Witty’s Currywurst. Every child will probably recognise the Brandenburg Gate, symbol of German re-unification. It’s a good idea to start your Berlin family holiday with a well-known landmark before going into more specific areas of the city. With hot food in our tummies we felt ready to conquer Berlin. 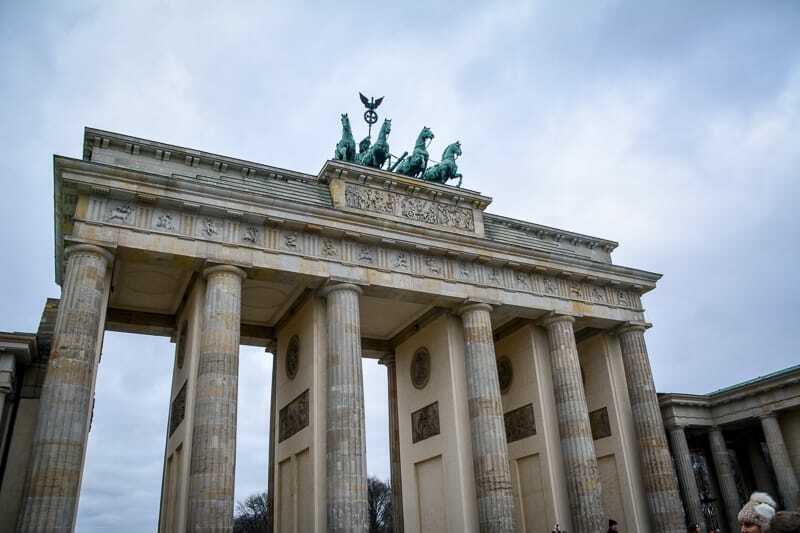 We started at Berlin’s most recognisable landmark of the city, the Brandenburg Gate. This was important, because the children knew the Brandenburg Gate from textbooks and TV and wanted to see it first-hand. From there, we walked down Unter den Linden, a broad boulevard with some stunning old buildings such as the State Library, Humboldt University (my Alma Mater) and the State Opera. At Bebelplatz we had a look at the Memorial for the Burning of Books by the Nazis which was not much more than empty book shelves below street level right in the centre of the square. The kids were quite puzzled. Why would anyone want to burn books? Humboldt University is my old alma mater. It’s a former prince’s palace with some nice historic features. The university has produced quite a few respected scientists such as Albert Einstein and Robert Koch. It’s free to go inside and have a look around. We explored the Museum Island without going inside any of the museums, figuring that the children wouldn’t quite enjoy the selection of classic statues and old oil paintings. If you consider visiting Museum Island with children, Pergamon Museum might be the best option once the museum is back to its former glory. Click here to conveniently buy your tickets online and skip the line! 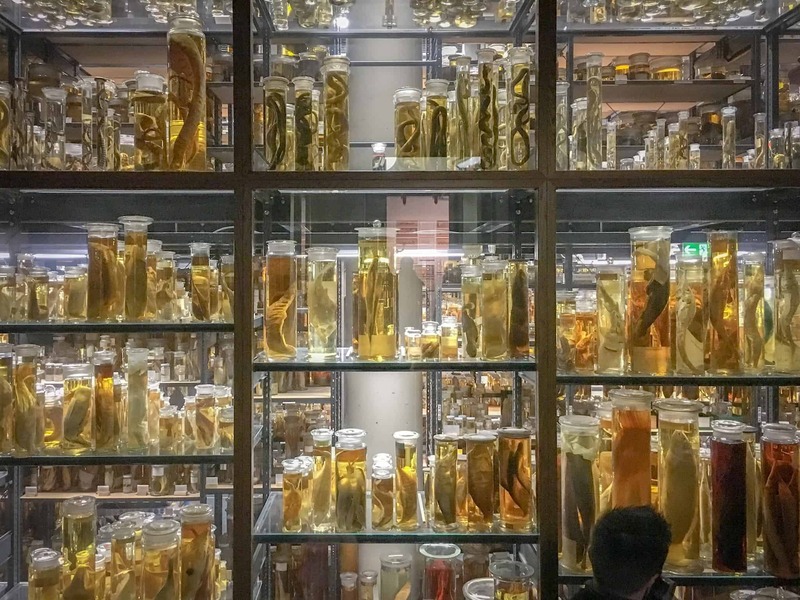 (affiliate link) It is partly under renovations, meaning that some of the most spectacular exhibits are currently closed to the public. Even if you are not planning on visiting any of the museums on the UNESCO listed Museum Island, a walk around the old structures is entertaining and atmospheric in its own right. We had a quick look at Berliner Dom, the biggest church in the city, but instead of going inside we chose to pay a visit to the small café in the basement where we had coffees and cakes to warm us up after our walk in freezing temperatures. We knew that this was the most we could get out of the children on their first day in Berlin, and so we walked back to Friedrichstrasse Station to take the train home to our apartment in Invalidenstrasse. We started our first proper day in Berlin with a visit to the Reichstag, the parliament of Germany. The best thing about the Reichtag was the modern glass dome that had been added to the historic building when it had been decided that Berlin should once again be the capital of a reunified Germany. It was free to visit the glass dome, so that was great too, and there was an audio guide and some information available to explain the interesting history of the building that had seen many different forms of government including fascism. 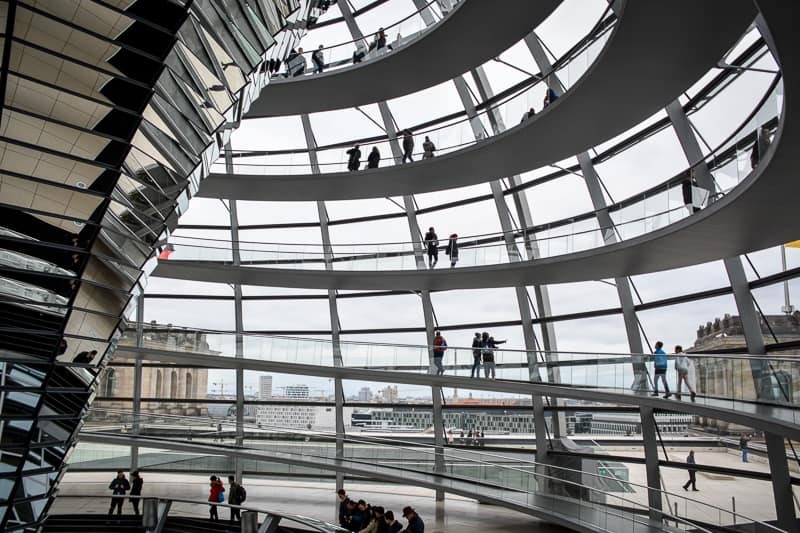 Even if you are not interested in the history of the Reichstag, the views and the spiral walkway are well worth the visit, the kids will love it! Kids will love the spiral inside the Reichstag Dome and the views from the roof of the building. Even though it’s free to visit, you will need to prebook well in advance. Note that it’s essential that you pre-book your visit well in advance even though it’s free, and that you carry identification with you when you visit. You will have to get through security checks similar to airport checks before you are guided to the building proper. You can book your visit here. From the Reichstag building we found our way to the nearby Memorial to the Murdered Jews of Europe, also known as the Holocaust Memorial. On our way, we saw many organised fraudsters in the parks, so please be careful and don’t let them tempt you into betting money on games that you cannot win. 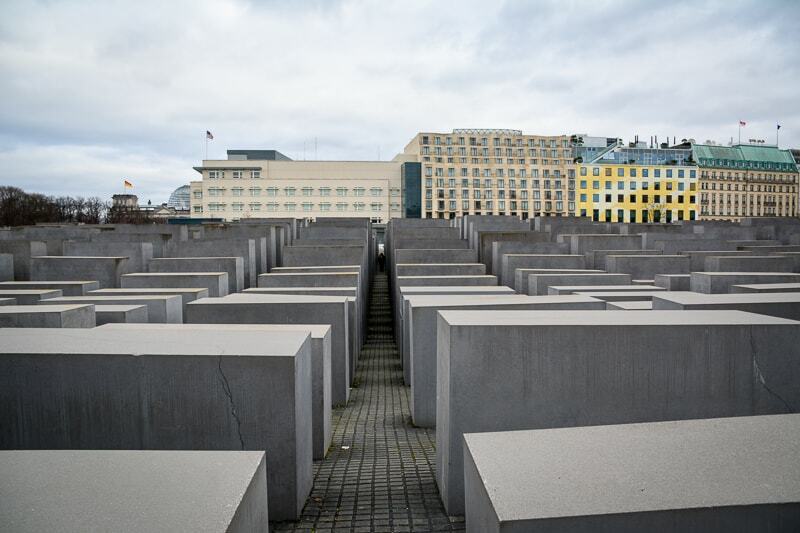 The Holocaust Memorial was a free exhibition, a huge field of concrete stelae who represented the many victims of Nazi terror and the Holocaust. It was a memorial that was easy to explore with children, yet at the same time it was a very immersive and well-rounded experience. We explained to the children beforehand that this was not a playground, so running, climbing, and screaming was not acceptable, which they understood. Berlin is a city of contrasts and there are some truths that are not so easy to swallow. We found that the Holocaust Memorial with its maze of steles was a good way to introduce the children to the difficult topic of racism and genocide. It was a tough thing to touch on with children anyway, the Holocaust, so we didn’t go into details with them, but we knew that they would remember the experience on the day that will inevitably come where they would ask questions about this part of the German history. We noticed that nearby there was a The Art of Banksy museum which might have been a great choice for families but we decided to leave this to another day since we had plans of visiting many other street art places later during our trip anyway. After seeing the stelae we returned to the Brandenburg Gate, walked through it for the first time and then decided to walk again to Museum Island. 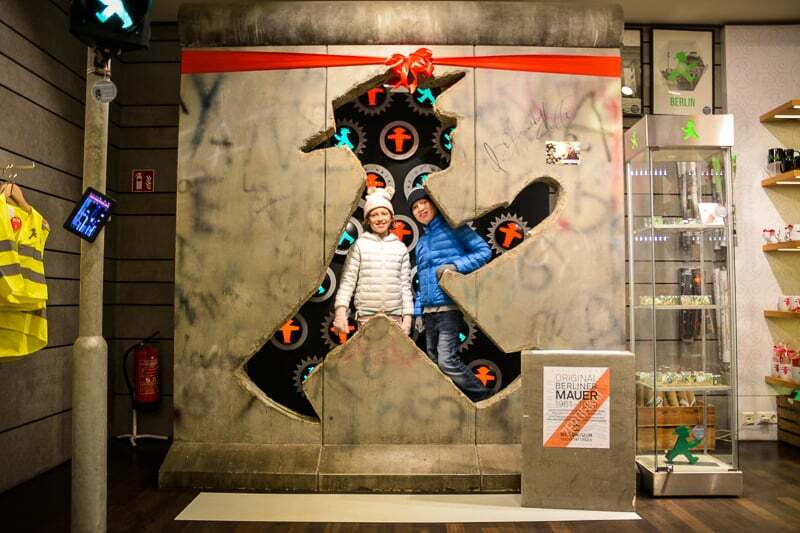 Don’t miss the Ampelmänchen Store on your way as you will find here a piece of Berlin Wall with a traffic light man shaped hole for photos and selfies. Everybody loves the cute Ampelmännchen! (Here carved into a section of the Berlin Wall). After the German reunification, the traffic light people from East Germany slowly disappeared from the streets to make way for the more sober Western version. But the people protested and ensured that the Ampelmännchen made a return. It is now one of the most loved symbols of Berlin. 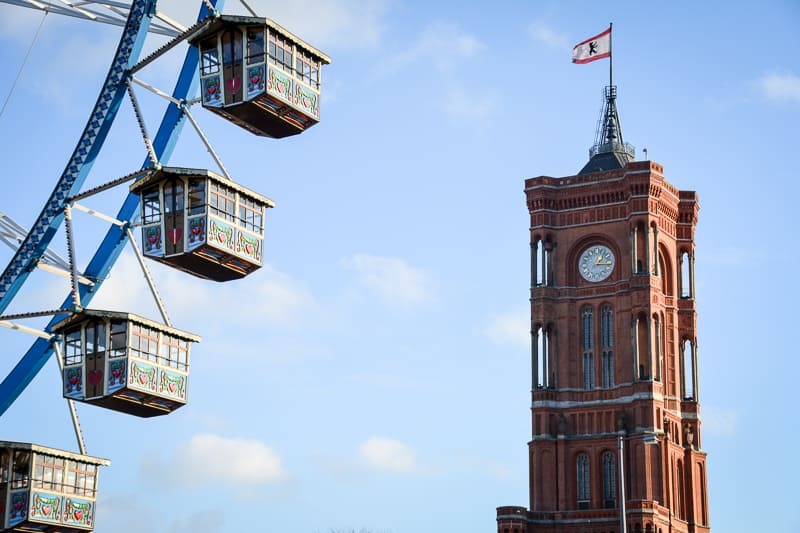 For an off-the-beaten path experience we recommend the children’s theatre company Märchenhütte in Monbijou Park, just on the other side of Museum Island on the river Spree. Berlin has not just the well-known sights to offer for family. It is indeed a city where people live and work, and visitors are very much welcome to also explore the more local attractions of Berlin. If that’s too repetitive for you and you don’t walk to Museum Island, catch Bus 100 instead for a cheap round trip across Berlin on public transport. The bus stops right next to the subway station Brandenburger Tor and will take you to West Berlin past the Reichstag, House of the Cultures of the World, Bellevue Castle, Grosser Stern and all the way to Berlin Zoo. If you are lucky you get free seats in the front of a double-decker – the kids will love it! If your kids love Lego then the Lego Discovery Centre is a good option to keep them entertained. There are a couple around the world but each one of them comes with some local displays in the miniature world which makes each visit worthwhile. Sure, this is not Legoland but there are still a couple of rides and workshops and a cool 4D-cinema that the kids will certainly enjoy. We pre-booked our tickets and came early just to be sure because places like this tend to fill up pretty quickly. Lego Discovery Centres are always a winner with my children. The good thing that the individual centres focus a lot on their location, so kids get to see some interesting things about Berlin while still have lots of fun! As it happened, Lego Discovery Centre could be found at Potsdamer Platz, a place that had probably seen the most dramatic changes over the last 100 years. Around 1900, Potsdamer Platz was a thriving centre and a busy crossroad. The first place where people would see traffic lights and electric lanterns. During the war, it saw massive destruction and then it had the fate of being located right between the sectors of opposing allies. Potsdamer Platz was a wasteland for around 50 years, and now look at it, the modern office towers, the glitter and lights of the shops and museums, the many attractions and diversions! You might not find it very appealing but you couldn’t deny that Potsdamer Place belonged to Berlin like no other place. Need to rest your feet? It’s been raining non-stop? The movie theatre at Sony Centre, Potsdamer Platz shows daily movies in the English language version. We had movie tickets at the Cinestar to see “Coco” in the afternoon, but before that we caught the train to Bülowstrasse to check out the brand-new Urban Nation street art museum. Trust me, it was one of the best art galleries I’ve ever been to in my life. It was full with all the big names and some interpretive signs, and entry was free. Make sure you arrive via Bülowstrasse Station rather than Nollendorf Platz, as your way to the museum will be adorned with commissioned street art on both sides of the road, and you don’t want to miss that. Urban Nation is a free street art museum which is great for families. My kids love the fun designs of the young artists. 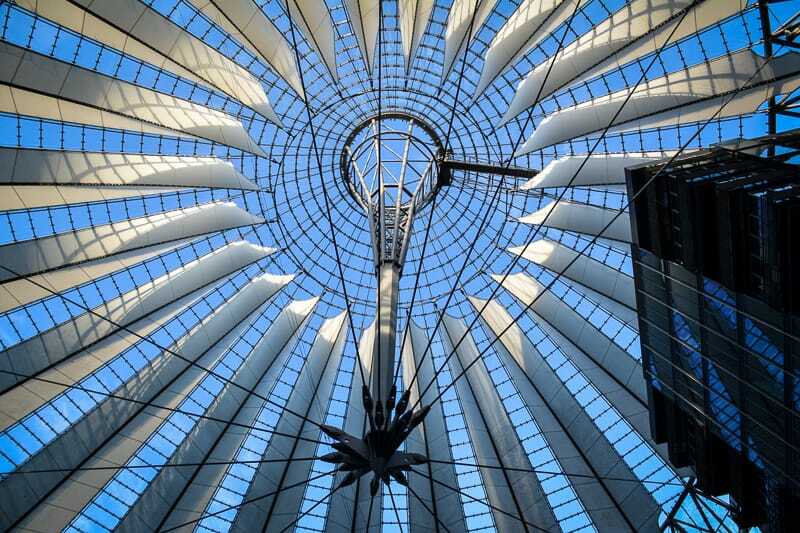 After our visit to Urban Nation we returned to Potsdamer Platz to catch our movie in the English version, overindulged on too much popcorn and generally had a wonderful time just being a regular family in Berlin. It was Day 4 when shops other than tourist shops would finally open for business again after the long Christmas break. 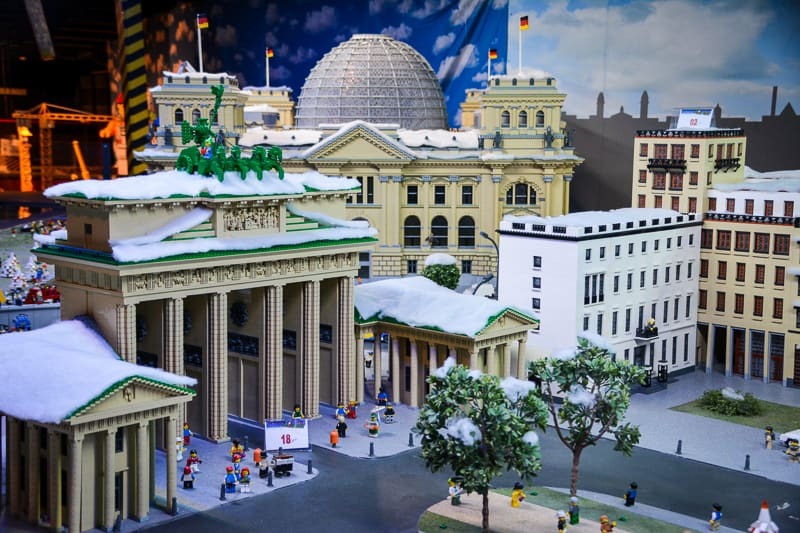 We had promised our first-born that he could pick two sets from the Lego Flagship Store on Tauentzienstrasse in West Berlin, figuring that he would get the best selection of Lego toys available in the city. And we were right. There were many different sets to choose from and we knew we had the perfect Christmas gift for him. For child number two we walked a couple of metres down the road to KaDeWe (Kaufhaus des Westens), Berlin’s biggest department store, steeped in history. In the toy department, she was allowed to pick a gift of her choice, and then we had plenty of time to stroll through the amazing fresh food section which looked too good to be true. Kaiser Wilhelm Memorial Church is surprisingly beautiful on the inside. Not many people realise that you can inside the church which was almost completely destroyed during WWII. 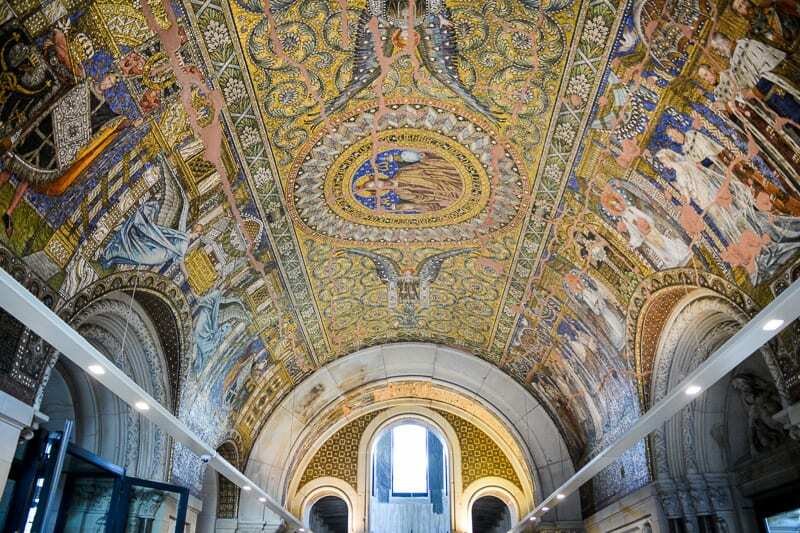 Look at the splendid ceiling – it’s free! Around Kaiser Wilhelm Memorial Church there was a lovely Christmas market. We couldn’t help but explore the stalls before we visited the insides of the destroyed church. It’s hard to believe how beautiful it looked on the inside! We can only recommend you visit this reminder of the wars when you are around. Also make sure you have a quick peek inside the modern part of the church. It does look rather bleak on the outside but shines in shades of blue on the inside. Right next door, the New Kaiser Wilhelm Memorial Church is beautiful too but in a very different way. Visiting both churches one after each other you can start some interesting conversations with the kids about art history. If you have time, make sure you also pay a quick visit to Europa Centre, a shopping arcade with a stunning clock made up of liquids, The Clock of Flowing Time. Our initial plan was to walk down the shopping boulevards, following Kudamm (Kurfürstendamm) all the way to our old neighbourhood. I just love looking at the glorious houses where the nobility and rich people used to live a hundred years ago. When you get a chance, have a look inside the old entrances of these buildings and you may see old elevators, chandeliers, and gilded mirrors. There was also an intriguing museum included in our itinerary, The Story of Berlin, which we would have loved to see, but looking at our son and his newly purchased Lego boxes we resigned to the idea that we had to return to the apartment to let him play with his new Lego. A great alternative for warmer temperatures is by the way Berlin Zoo which has a beautiful giraffe house and used to be home of Knut, Berlin’s most famous polar bear cub (he died prematurely, unfortunately). Berlin is known for its backyard culture, and Hackesche Höfe is probably the best known and most developed example. Explore the different courtyard with the kids, buy some hand-made sweets, fashion or toys and imagine what life must have been like back in the day, even for kids. We started our fifth day in Berlin with a visit to Hackesche Höfe. Today, this complex of apartment buildings and interconnected courtyards were a tourist attraction. But during the time of the Industrial Revolution these dwellings had been an overcrowded mess, where playing children would share the yards with dirty businesses and loud delivery carts. Hackesche Höfe were remarkable thanks to their Art-Nouveau appeal. The many small shops offered a wonderful mix of handicrafts, fashion, delicatessen and memorabilia. 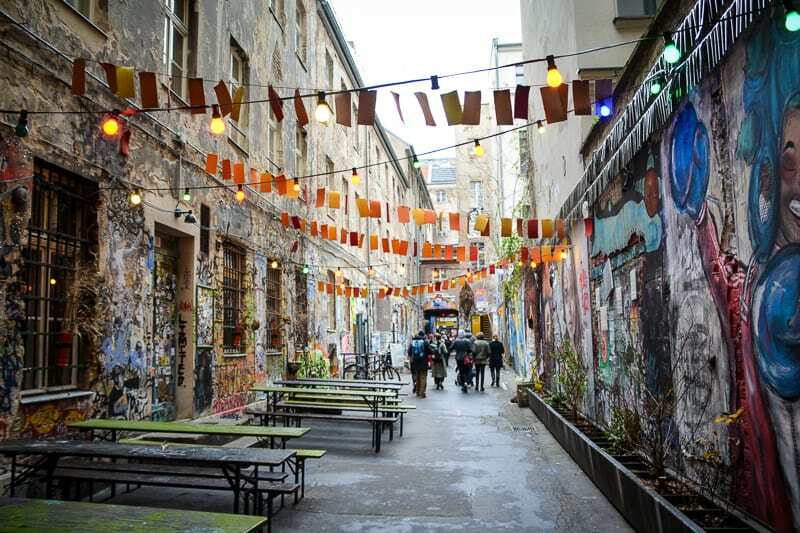 One of our most favourite places in Berlin is the backyard near Hackesche Höfe that leads to the Anne Frank Museum. It’s colourful, fun, naughty, exciting, surprising and quite extraordinary. What a different world did we find next door, however, when we entered a small laneway leading up to the Anne Frank Zentrum. The laneway was covered in public street art. Murals and graffiti, yarn and sculptures, wheat pasting and stencils. So much to see, so much to explore! We were immediately sucked into the subculture atmosphere of the place. Anne Frank is a figure that is easily understood by children. If you want them to learn more about the Holocaust, this little museum in Berlin is your perfect choice. We stopped at Anne Frank Zentrum, simply because it just happened to be there. The museum was a great way to explain some very complex matters to the children by using the example of a little girl. The video that was shown in English was quite easy to understand for children ten years and up. Just note though that there was (naturally) a lot of black and white photography included. This may not have been as exciting for kids of this generation. We also explored the gallery of objects mentioned in the movie, everyday things that defined the lives of Anne and her family. After the museum we went a little bit further into the courtyard and entered a building in the left corner. It was the entrance to a fashion boutique on one floor and a contemporary art gallery on the upper floor. 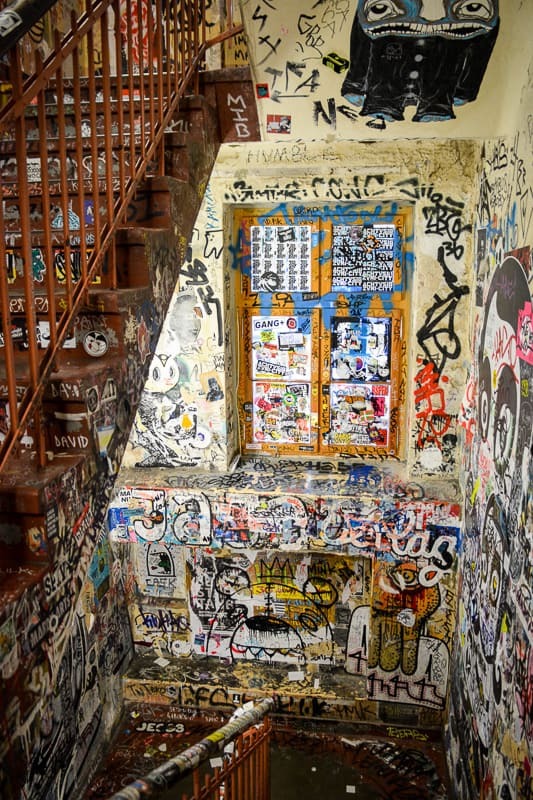 So much to see, so much to explore at Haus Schwarzenberg. The Berlin craziness that is Schwarzenberg Haus. From Hackescher Markt we took the train to the Computer Games museum. A great choice for all of us, as we got to explore so many well known games. We also learned about the evolution of the gaming industry. A good part of the visit we just watched a lot of heartwarming clips of games from our childhoods. Highlight was a small video arcade where we could play some computer games for free. After that, we took the train to the world-famous Eastside Gallery. A section of the Berlin Wall that was allowed to stay where it was, but now used by street artists as a canvas. We walked along the length of the exhibition and had a look at the variety of artwork. We love the way the artists interpreted the space. How they expressed their opinions and feelings. And how it encouraged us to talk about politics and society. What was life like in Eastern Germany? The DDR Museum gives great insights into all aspects of GDR life. Our most favourite part of the museum was the complete East German apartment that you could walk through. I remember growing up in a Germany that was still divided – I grew up in the West. In the end, it was Eastern Germany that went under, and I was happy to show the kids a world that was long gone: at the DDR Museum. DDR – that is German for GDR. GDR stands for the Eastern German “republic” that came into being after World War II. It ended with the fall of the Berlin Wall. We loved exploring this very interactive museum. Here you get to touch, handle and see so many things that even the kids understood parts of this very complex topic. Highlight for us was the East German walk-in apartment. The kids could watch East German TV, open many kitchen cupboards and even learned a thing or two about the love life on the other side of the wall. It can get extremely busy at the DDR Museum, so it’s best you pre-book your tickets online (affiliate link). Romantic vibes in summer and winter. Nicolai Quarter is the oldest part of Berlin and comes with some expensive but good German restaurants. From here, we walked down to Nicholas Quarter, the oldest part of Berlin which came with cobblestone streets, a church in its centre and some charming vistas of old houses. Not as romantic as I would have envisioned it to be and probably best enjoyed in summer when the temperatures are less icy and the restaurants put their tables out. We returned to our apartment via Alexanderplatz. It’s generally a chaotic square with quite a few shady people about but it’s worthwhile pointing out the World Clock which simultaneously displays the time in 148 major cities around the world. The Berlin Wall Memorial explains everything there is to know about the Berlin Wall, the death zone, and the flight attempts. The park is great to let the kids run wild while at the same time learn about the German-German border. Close to our apartment there was another major tourist site. The Wall Memorial was the site of the former frontier between East and West along Bernauer Strasse. You can see sections of the Berlin Wall here, skilfully interspaced by vertical iron bars to open up the views. There were foundations of houses, torn down to make way for the Wall or to discourage escape attempts. Little plaques were set in the pavement in memory of people who tried to cross the border. A free interpretation centre and a lookout tower complete the experience. We had included a buffer day into our itinerary. Not just because we couldn’t be sure with the weather. It was also much cheaper to fly home on the 31st of December rather than on the 30th. Now, if you have that much time at your hand, you have several options to explore. If that’s not your thing, consider visiting the German Technic Museum instead. It’s another very child-friendly museum with lots of interesting things on display such as cameras, cars, ships and aeroplanes. There is also an experimental area specifically designed for kids. You really cannot miss this museum as it has a small plane on its roof. Our alternative would have been to take the train out to Potsdam and explore the castles and parks there. My favourite castle is the New Palais although most visitors will want to see Sans Souci instead. Due to the cold weather and the fact that the children wouldn’t have enjoyed the old buildings as much as we would have, we decided against it. In summer, a trip to Potsdam however is a wonderful day trip out of city. We departed on day 8, leaving Berlin with a heavy heart. There was such much more to explore that we didn’t even touch on. But most of all it was this very special atmosphere of the city that we adored. We hope to return soon. Oh Berlin, What Have you Done to me?